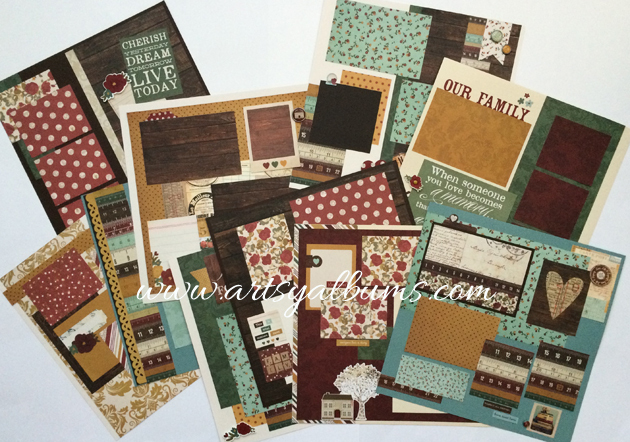 A new 10-page scrapbook kit featuring Simple Stories Legacy ... love this collection!! Complete ten 12x12 scrapbook pages quickly and easily with our pre-cut kit. Specially priced at just over $5.00/page, this kit is an amazing value! The do-it-yourself scrapbook kit includes all of the materials to make 5 complete 2-page coordinating layouts and the theme is perfect for all of your family or heritage photos. Beautiful papers and embellishments by Simple Stories are pre-designed into 5 2-page layouts to make saving your photos and memories fun and easy! If you order the pages pre-made -- they will be delivered complete, ready for your photos, and can easily slide into a 12x12 scrapbook album. A DIY kit is fun and easy! All of the pieces are pre-cut and full-color instructions are included. You'll have your scrapbook completed in no time! All you'll need is adhesive!